Protesters flooded the streets of Ferguson, Mo., turning violent tonight after a grand jury in St. Louis County announced Ferguson police officer Darren Wilson would not be charged in the shooting death of Michael Brown, 18. The decision came after months of consideration by the 12-person panel in a case that previously sparked riots and looting in the town of 21,000. The grand jury deliberated over two days after hearing testimony from 60 witnesses, some of whom gave inconsistent accounts. They determined that no probable cause exists to file any charges against Officer Wilson. We are profoundly disappointed that the killer of our child will not face the consequences of his actions. While we understand that many others share our pain, we ask that you channel your frustration in ways that make a positive change. We need to work together to fix the system that allowed this to happen. President Obama, in nationally televised remarks before reporters at the White House beginning just after 10 p.m., urged Americans to heed a call for nonviolence from Brown’s father, Michael Brown Sr.
We are a nation built on the rule of law, so we need to accept that this decision is the grand jury’s to make. There are Americans who agree with it, and there are Americans who are deeply disappointed, even angry. We need to recognize this is not an issue just for Ferguson. This is an issue for America. We have made enormous progress in race relations over the course of the last several decades. I have witnessed this in my own life, and to deny this progress is to deny America’s capacity for change. But what is also true is that there are still problems, and communities of color are not making these problems up. As the grand jury’s decision became known, however, some protesters crowded outside the courthouse in Clayton and in the streets of Ferguson grew violent, and gunshots were heard. Late tonight, a Fox News reporter in Ferguson said he had heard more than 90 shots. Protests also began taking place in major cities including Los Angeles, New York City and Washington, D.C., where a crowd gathered outside the White House. According to the St. Louis County Police Department, someone threw a Molotov cocktail at police officers, and protesters shattered windows of a Ferguson police car as they tried to overturn it. Reports of looting in the St. Louis suburb began flooding in, and protesters threw rocks, batteries and bottles at police officers. Televised images showed multiple fires. Police used smoke and pepper spray to disperse protesters. The case became racially charged as pundits speculated about Wilson, who is white, and Brown, who was black. In the months of the grand jury’s meetings, McCulloch said, they learned that witnesses offered differing accounts of the altercation between Wilson and Brown, and some witnesses later took back their statements. Key witnesses who proved convincing to the jurors, describing Brown’s “full charge” at Wilson, were black and had not spoken to the press, McCulloch said. The conflicting statements, he said, often did not match the physical evidence, which showed Brown had been shot six times. Prosecutors presented the grand jury of nine whites and three blacks with five potential indictments. News broke before noon today that the grand jury had reached a decision regarding the Aug. 9 incident. “Now is the time to show the world we can act without being destructive,” St. Louis County Executive Charlie Dooley said in a press conference earlier tonight. The Department of Justice Civil Rights Decision continues to investigate the case at the urging of Attorney General Eric Holder. Reports, however, suggest the government does not have a case against Wilson. Michael Brown’s death was a tragedy. This incident has sparked a national conversation about the need to ensure confidence between law enforcement and the communities they protect and serve. >>> Q&A: Is It Legal to Use the National Guard in Ferguson? Officials in cities across the country braced themselves for protests following the grand jury’s decision, and Missouri Gov. Jay Nixon, a Democrat, declared a state of emergency and activated the National Guard. Because of the growing fears of violence in the wake of the decision, Ferguson-area schools were closed today and will remain closed tomorrow. Violent protests and threats against law enforcement, members of the grand jury and Ferguson Police Officer Darren Wilson have no place in an ordered society and can never be justified. General Holder should issue an explicit warning about immediate prosecution of those who would engage in such misbehavior. >>> Area Residents Take to the Streets of Ferguson. But Not For the Reason You Think. The American Civil Liberties Union of Missouri said Brown’s death raised a larger issue of how law enforcement officials treat people of color. While many officers carry out their jobs with respect for the communities they serve, we must confront the profound disconnect and disrespect that many communities of color experience with their local law enforcement. In the days leading up to tonight’s announcement, Obama and Nixon called for calm and respect for the rule of law. You know, this is a country that allows everybody to express their views, allows them to peacefully assemble to protest actions that they think are unjust. But using any event as an excuse for violence is contrary to the rule of law and contrary to who we are. This is America. People have a right to express their views and opinions. Violence will not be tolerated. The residents and businesses of this region will be protected. St. Louis officials joined in the governor’s calls. Don’t let fear or violence further divide our city. Reject both. Pray for peace. Work for justice. Push for change. Violent protests and riots first erupted in the St. Louis suburb more than three months ago after Wilson shot and killed Brown after a confrontation. >>> ‘Militarization’ Critics Want to Review Pentagon Program After Ferguson. But Police Get Their Gear This Way, Too. Holder responded to events in Ferguson, visiting the town, and instructed the agency’s Civil Rights Division to step in. He also directed the Federal Bureau of Investigation to investigate. Protests raged for weeks, and businesses in Ferguson boarded up doors and windows after looting occurred. A QuikTrip convenience store was burned to the ground. Police in Ferguson and St. Louis County responded to the protests with armored trucks and riot gear, which prompted outrage from both the left and the right over the militarization of police. Images from Ferguson showed police officers wearing ballistics vests, deploying tear gas and carrying semi-automatic rifles. As debate over the militarization of police grew, the White House called for a review of the program that allows law enforcement agencies to obtain excess military equipment: the Department of Defense’s excess property program, also known as 1033. The Obama administration continues to look into the program. 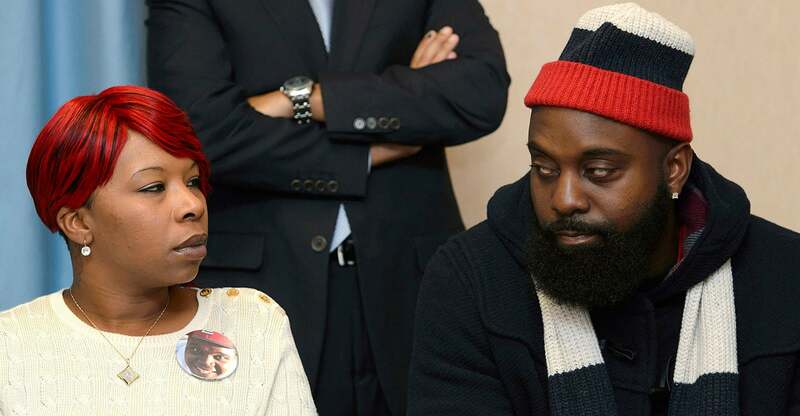 Brown’s autopsy showed that he was shot six times, and the report from the St. Louis County medical examiner supported Wilson’s claim that Brown assaulted him in his police car. Brown had marijuana in his system at the time of his death. He had just been videotaped strong-arming a convenience store clerk while stealing cigars from the store. The grand jury convened in mid-August to consider multiple charges, including first-degree murder. Wilson, a six-year veteran, reportedly has decided to resign from the Ferguson Police Department and not return to his post.